I had the amazing opportunity to ride along in a B-17 Flying Fortress flying as part of the Wings of Freedom tour, made its way from Porter County Municipal Airport in Valparaiso, IN to Chicago Executive Airport in Wheeling, Illinois. The Wing of Freedom Tour is currently made up of three planes that served as the backbone to Allied air attacks in World War II, the B-17 Flying Fortress, B-24 Liberator and B-25 Mitchell. When I arrived at the airport there was a nice crowd of people taking tours of the three planes. Visitors can tour the planes for $10 ($5 for children under 12). Though standing out from the crowd were several veterans that seemed content sitting and looking at these historic aircraft that many had flown in during the Second World War. As the Collings Foundation, founded to help preserve living history, started breaking down the sales tables and preparing the planes for flight I was filled with anticipation for the flight. 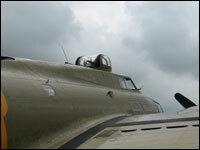 As we boarded I found my seat a spot on the floor on a pad leaning against the wall right next to the left tail gun. We received a short briefing explaining that we should remained belted in until airborne at which point we could have the freedom to move about the aircraft providing we did not get in the way of the pilots, lean on any doors that might not be completely secure or put our hands on the wires running through the inside of the fuselage that are responsible for moving the control surfaces. A few minutes later the engines made a magnificent noise as they roared to life. We rolled down the runway and smoothly lifted into the air. There were ten of us aboard like there would have been for a combat mission. 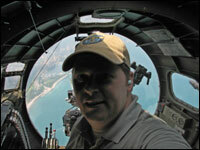 For us the flight would be all enjoyment for the crew that flew during the war it was much different. A typical crew of a B-17 aircraft included a Bombardier, Navigator, Pilot, Co-Pilot, Flight Engineer, Radio Operator, Ball Turret, Left & Right Waist Gunners and Tail Gunner. 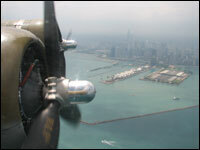 I started off the flight enjoying the view from the tail of the plane from the waist gunner's vantage point. Then as the flight progressed made my way to the Radio Room which had a section of the roof opened up providing a nice breeze. After that I checked out one of the better vantage points on the plane, from the Flight Engineers turret at the top of the plane. This gave a clear view 360 degrees around from the top of the plane. As beautiful a view as it was it was nothing compared to that provided from the Bombardier's space at the nose of the plane. I climbed down below the pilots and crawled to the front into the Bombardier nose section of the plane to the best view in the house. The nose is made of plexiglass giving a wonderful view from the very front of the plane. I enjoyed watching the Chicago skyline go by from this great vantage point. Also on board for this flight was former B-17 Pilot Dave Weinberg who flew 28 missions in the B-17. He was joined by his Son-in-Law and Grandson on his first flight in a B-17 since the war. I am sure this was a memorable flight for them all. I had previously heard legendary stories of this planes ability to take a beating but still bring the crew home safely. Weinberg shared a story to support the legend commenting that the B-17 had about the same ability to glide as a brick yet during one of his missions he lost three of the four engines but was still able to bring the plane home safely. It was special to hear a few short stories of his about the war and specifically the B-17. That is part of why it is so special that these planes fly on allowing those stories to continue to be told and shared with generation after generation. Despite nearly 12,000 B-17 being built there are now only 9 still in flying condition in the United States. This aircraft is an amazing aircraft but not nearly as amazing as the young men that flew it to preserve freedom. Check out the Collings Foundation website and see when this aircraft will be visiting an airfield near you. I guarantee you will not regret taking the time to visit with it and the people that share the love for it. I have also uploaded some photos of the flight to Flickr and a few short video clips to YouTube for viewing. I rode in the same plane a couple weeks ago at KIKV, Ankeny, IA. Very cool photos by the way. The photo of you in the bombardier's really does look like the cockpit of the Millennium Falcom. That is so cool that you got to do this. I have always wanted to, but it's pretty expensive for my budget. Thanks for sharing the pictures and video.